Please try to come along to our AGM on Tuesday 30th April and learn a little bit more of what we do, or indeed what you could do because we are desperately seeking volunteers to help with our busy programme of projects. If you have a little spare time and perhaps a specific area of interest then you will be warmly welcomed. Details of the AGM are shown below and entrance is FREE. Read the fascinating story of Mary Stapleton-Bretherton who inherited Rainhill Hall following the death of her mother Jane in 1869. Mary was a wealthy childless widow who was very influential in re-designing the Hall into the building we know today. Audrey Thomas is a descendant of Mary's mother, Jane and has written a detailed account of Mary's life. Audrey has agreed to share it with visitors to the Rainhill Remembers website. Enjoy! 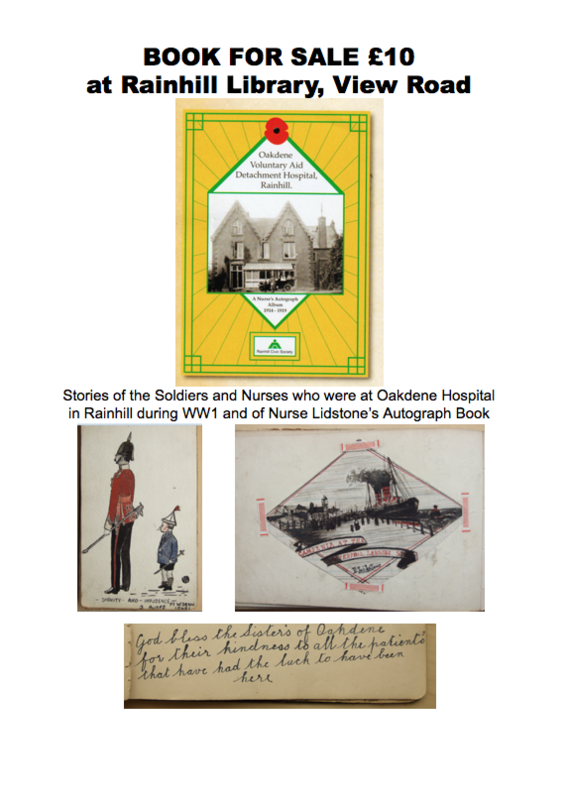 Our new publication about a VAD Hospital in Rainhill during WW1 and the soldiers who wrote in Nurse Lidstone's Autograph Book is now on sale for £10 in Rainhill Library, View Road. The Rainhill Remembered group meets on the second Tuesday of the month, except August. Anyone interested in Rainhill's past is welcome to come to these informal get-togethers where people can look over pictures and documents and exchange memories of Rainhill over a cup of tea. Each session runs from 1.45pm to 3.45pm in the St Ann's Millennium Centre, View Road, Rainhill. ​The Rainhill Remembers website was launched on Remembrance Sunday 2015 by the Heritage Group of Rainhill Civic Society. ​To date, the main focus of the website has been the impact of the Great War on the village of Rainhill and inside you will find a wealth of information relating to soldiers who paid the ultimate sacrifice, those who survived, the role played by Rainhill V.A.D. hospitals, a history of the Stapleton-Bretherton family and much more. Clicking on one of the boxes shown below will take you to the relevant page. ​In 2018 we intend to expand the site to cover other aspects of Rainhill village. Clicking on each panel below will take you to the relevant pages. You can navigate your way around the site at any time by selecting the three bars at the top left of each page and choosing your topic. Many of the pictures displayed in this site have a watermark showing the name of the website. This is merely to discourage their uncontrolled use elsewhere without proper acknowledgement. Copies of unmarked images may be available on request via our Contact Page. Please do not use information or images from this website on other websites or publications without permission. The content of this website has been researched and written by members of the Rainhill Civic Society Heritage Group. Many individuals, locally and from other parts of the UK and abroad have also kindly contributed their own information and photographs. If you wish to reuse any quotes or images, please contact us first via our Contact page as permission may be needed from the owner. Please also see our Copyright page. High resolution versions of certain pictures may be supplied for personal use, on request.